Recently, we announced our September Amber Grant Finalists. Today, we’re thrilled to reveal the $1,000 recipient and the qualifier for our $10,000 year-end Amber Grant. 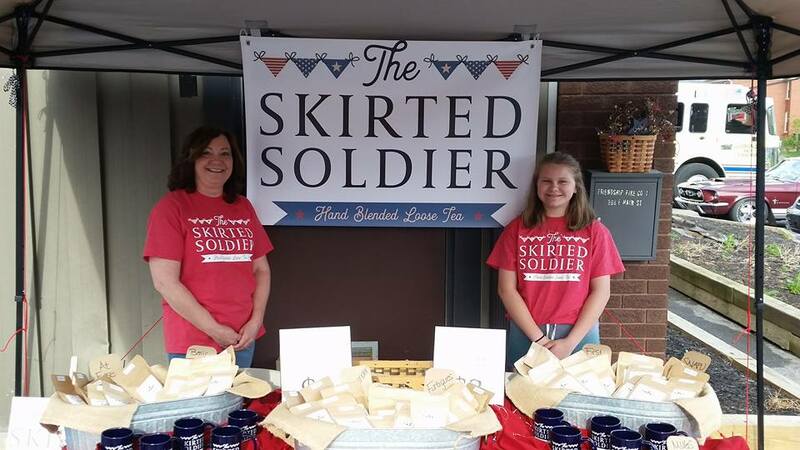 Congratulations to Rhonda Smith, Owner of The Skirted Soldier. A veteran of the Air Force, Rhonda was kind enough to share her story, from active duty service to entrepreneurship. WN: How did The Skirted Soldier come about? RS: I grew up in a small town in Western PA. I left for the military in 1993 (despite never being on a plane before)! I quickly realized that the military way of life was very structured, organized and demanding — yet rewarding and something to be proud of. I did a little over 8 years of full-time active duty service. I lived in 3 different states and a foreign country. I learned so much about life, duty, honor — and I carry that with me today. Honorably discharged in 2001, I moved back to my hometown and started working on a graduate degree (business). I had this disconnect with my military life and always wanted to figure out a way to feel that connection and give back to my fellow female veterans. It took me several years to develop a business plan and model that I was happy to stand behind and promote. I had this idea of owning my own female veteran focused company of some sort. This past March, I finally felt that I was in a position to make this dream come to fruition. Within about a month’s time, I had an entity, business plan, logo, materials, website, social media platform and product. And then we get to the product! So, I’ve had this idea for years. I had a business name idea. I had names for my products that were military related. I had criteria for the product such as shelf life, price points, shipping concerns, and the packaging designs of sorts. However, I didn’t have a product! In researching veteran owned companies, it was apparent that certain markets were saturated, and naturally I knew to stay out of those lanes. I knew the timing was right and I just needed to have that perfect product that wasn’t too niche, too expensive or seasonal. One day on our way home, my daughter was talking to my mom on her phone. We drove past a plaza in town and she mentioned to my mom about missing the tea shop that was in that plaza that is now closed. She went on to giggle about us going there and I would order coffee tea. Part of my light bulb went off on the 30 minute drive home and I started to think ‘hmm, if I can replicate this coffee tea blend, maybe that’s my product.’ Knowing that I couldn’t find a similar product in any store or online, the idea just grew from there. I started researching reputable cooperatives and community supported agriculture groups, as owning a small farm and being conscious to sustainability, I knew that had to be part of my model. I also wanted to find military owned or member owned cooperatives that shared our same passion for sustainable living, fair trade and integrity in their supply chain. I started sourcing in products from a few member cooperatives, one being local, and a great tea supplier to create my signature blend SNAFU- the coffee, tea, chicory blend. I loved it — and I just kept going from there. The loose tea product fit all of the criteria I had in mind and it was a great product. From there, I researched how to blend the perfect cup of standard flavors as well as seasonal flavors. I now carry six standard loose tea flavors to include a seasonal deployment that is only available for a short period of time. I have learned so much about tea, herbs and how to create flavors that blend and steep well together. I am really enjoying my craft and I’ve met some awesome people along the way who appreciate not only our business model, but our quality, integrity and product. WN: How do you differentiate from competitors? RS: Most competitors in this category are of the large, commercial type. I vowed to stay rooted in my mission, values and philosophy of hand blending each order in small batches. The quality is amazing and I won’t steer from that. I also perform my own grass roots marketing. I do not have an advertising budget, so I make calls, send emails and I have sent over 200 samples to businesses that I feel are aligned or would be a good fit with our product. I have had several places wanting to place an order just from my email, but I prefer to send my sample pack out first. I want them to see and try the product before committing to a sale. I feel as if this is just the right thing to do. RS: Shortly after I got started, I received an email from our PA Troops to Tractors leader, called PA Veteran Farmer Project. She was and is an amazing mentor, supporter, marketer, etc. She’s helped in so many ways to share our mission and guide me in the right direction. Our first-year sales donation will be a grant to female veterans that will funnel through the PA Veteran Farmer project. The parameters will focus on some sort of agribusiness. Each month, I’ve sent a combat care package out to a deployed unit. This will continue. I was contacted by a group up near the New York border — a group of female veterans that mostly live in the VA home. I will be reaching out to them to supply them with tea for their monthly meetings. From a local TV interview, my information was passed along to the Governor’s Council on Military and Veteran Affairs- Women’s Veteran Committee. I am now a proud member of that committee. I have been invited to receive an award on November 12 from the Women’s Entrepreneurial Day event in Philadelphia. I hope to use that award to help other female veterans see that they can successfully start and operate their own business. Next year, we are hoping to host an outdoor event for female veterans to join together and fish, hike, kayak, and share stories and a meal. We are in the very preliminary stages of this planning process. Recently, I donated to a local fundraiser called Sweat for Vets, a race event that raises funds for local veterans. I paid for one registration for a veteran or first responder to attend. Along the way, we’ve supplied gift baskets for local fundraising events and will continue to do so as we are able. This includes a local nursing home, breast cancer awareness event, and a first responder fundraising event. WN: What goals do you have for The Skirted Soldier, both short and long-term? RS: My short-term goals are to continue marketing our product. I’d like to be in every state by my one-year anniversary date. I am in the process of turning one room in my house into my shop. This grant will allow me to do that as well as order stainless steel equipment, packaging and product in bulk. I can also organize my inventory and polish up materials. My long-term goals are to grow into a successful recognizable brand that is able to employ female veterans. I would like to become a well-known tea company, but only if I can continue to support female veterans along the way. The experience has been surreal. We’ve come so far and we’re humbled by the awards and support just since March. We won’t let you down! This is just our beginning! WN: What advice would you give to someone looking to start their own business? RS: I continue to live by the Air Force Core Values: Integrity first, service before self and excellence in all you do! Along with my core values, I feel that in order to be successful, you have to do your homework. You must know the rules and regulations of the industry. You must know how to make smart business decisions, marketing plans, strategic plans, a solid business model and stick to it. Reflect back monthly on your accomplishments and if something isn’t working, fix it. Try another strategy. Don’t give up — work hard/play hard. Starting your own business is hard work and it’s totally worth it. Don’t be afraid to ask questions, reach out for help and find any/all resources to learn from. ***Throughout this document, I say “we” a lot. I can’t fulfill my dream of operating The Skirted Soldier without the support and help of my family. I would be remiss to not include that. They have been amazing (and my husband is retired Air Force). Thank you for reading and congrats again to Rhonda. We wish her the best moving forward. With October in full swing, we’re already seeking out the next $1,000 Amber Grant recipient. If you’re searching for funding, please consider filling out an application.